Being interviewed by a local journalist provides an opportunity to have a voice in the civic life and local news ecosystem of one’s community. But it remains a relatively rare experience, as only about a quarter of U.S. adults (26%) say they have ever done so. And among those who have, not everyone’s voice is equally likely to be heard. Whites, as well as college graduates and those with higher incomes, are more likely than nonwhites to have spoken with or been interviewed by a local journalist, according to a survey by Pew Research Center. About three-in-ten whites (29%) say they have ever spoken with or been interviewed by a local journalist or reporter, compared with 19% of nonwhites. (Nonwhite includes all racial and ethnic groups except non-Hispanic white.) This difference is particularly striking given that nonwhites generally are more engaged consumers of local news than whites. For instance, while 43% of nonwhites follow local news very closely, only a third of whites say the same – a similar pattern to what we found in our 2015 study of local news habits in three cities. Among adults of all races, women are about as likely as men to have spoken with or been interviewed by a local reporter (28% of men versus 24% of women). However, a gender gap emerges among white U.S. adults. Roughly a third of white men have spoken with a local reporter (32%), compared with only about a quarter of white women (26%). 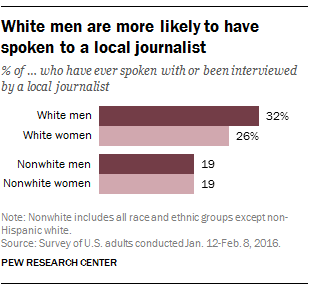 Among nonwhites, women are just as likely as men to be interviewed by a local journalist, with 19% of both genders saying they have had the experience. Experiences in talking to local journalists also differ starkly by respondents’ level of education. Those with a college degree are twice as likely to have spoken with a local journalist as those who have never been to college. Just over a third (36%) of those with at least a college degree say they have spoken with a local reporter, compared with 23% of those with some college education and 18% of those with a high school diploma or less. A similar pattern is evident when considering Americans’ income levels, with those earning $75,000 or more per year being most likely to have been interviewed by a local journalist. There are very few differences across age groups in whether or not someone has spoken with a local journalist, however. Those ages 18 to 29 are less likely than any other age group to have had a conversation with a local reporter, but those 30 to 49, 50 to 64, and 65 and older are all about as likely to have done so. Those with strong local news habits are only somewhat more likely to have had conversations with local journalists. It is more common among those who follow neighborhood news very closely (26%) and somewhat closely (29%) than those who don’t follow neighborhood news closely at all (21%), but there is no difference between those who follow local news very closely and those who follow it not very closely or not closely. And while speaking with a local journalist is about twice as likely among those who say local journalists are in touch with their community (31%) as those who say they are not (15%), there are no differences between those who trust their local media a lot and those who do not, or between those who approve of the job their local media do and those who do not. The highly civically engaged, however, are still more likely to have had conversations with a local reporter, as found in a recent Pew Research Center report. For example, those who always vote in local elections are more likely to have been interviewed by a local journalist (35%) than those who do not always vote (22%). Jessica Mahone is a temporary research associate focusing on journalism research at Pew Research Center.